Posted on September 3, 2009 by tbean@illinois.edu. SmithGroup and representatives of ECE ILLINOIS and the University of Illinois are approaching the end of the “schematic design” phase, in which various elements are assembled and stacked like 3D puzzle pieces within a potential building form. The objective has been to evaluate the location and adjacencies of the various office, classroom, laboratory, and support spaces that will be used in the building. Another objective is to explore building arrangements that work efficiently to provide space for all the necessary functions. Throughout the process, the focus has been on ensuring that the finished building–in addition to its functional uses–will be inviting, space and energy efficient, and user friendly. After schematic design, the architects will prepare outside forms and design elements to create the ultimate “look and feel” of the facility. The process has helped those involved understand how the pieces will need to interconnect. Unfortunately, not all the most important things can fit on the first floor. Nevertheless, the process has so far been a relatively smooth one. SmithGroup will take the input from the department in development of more final drawings and layouts for the building. Once the firm presents ECE and the University with the official completed schematic design later this month, work will begin on the preparation of renderings of the new ECE building. Posted on August 3, 2009 by tbean@illinois.edu. 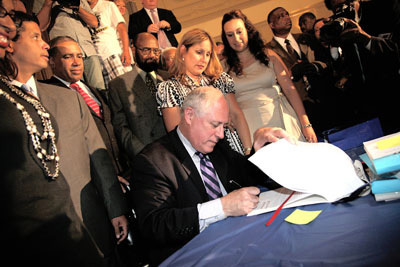 On July 13, Illinois Governor Pat Quinn signed into law a collection of bills dubbed the “Illinois Jobs Now!” plan. Contained within these bills were funds to support capital projects at the University of Illinois, including partial funding for the construction of the new ECE building. Among these state funds, $47.5 million is designated for use towards the construction of the new ECE building at Illinois. This amount is half of the $95 million total project budget approved by the University of Illinois Board of Trustees. Posted on July 3, 2009 by tbean@illinois.edu. On May 30, the Illinois legislature passed a state construction bill that included $44.5 million for construction of the new ECE building. Currently, that bill is awaiting the governor’s signature. This adds to the previous release of $3 million for planning, and commits the state to a total of $47.5 million out of the total $95 million budget. Plans for the new ECE building are continuing, and the building continues to receive the approvals it needs to become a reality. At the May 21, 2009, meeting of the University of Illinois Board of Trustees, the Board approved the updated total project budget. The approved budget for the building is now set at a maximum of $95 million. This updated project budget figure allows for flexibility in planning the most efficient and effective design for the new building. Posted on May 3, 2009 by tbean@illinois.edu. After five months of concentrated effort working with the SmithGroup architects and planners, the University has accepted the “program analysis” for the new ECE building. Initial approval occurred in mid-April. During this analysis phase, the architects translated ECE’s needs and objectives into classroom, laboratory, office, and support space allocations and layouts. The architects delivered a large book of configurations for every functional room proposed for the building, addressing all the most desired features within the target 250,000 gross square foot total. With this approval, the interior space allocations are essentially complete. The architects are in the “schematic design stage. Building contents will be assembled piece by piece, considering desired adjacencies, prominent entrances and lobby space, and contextual relationship to nearby buildings. This phase will yield a small number of potential building designs and visual renderings. Farther down the road, construction schematics and details will be prepared for the bidding process. The building designs will contain many exciting and unique spaces, such as flexible teaching lab layouts and an open student projects lab. There will also be student team rooms for informal group projects and discussions, large student lounges, and office space for student organizations. 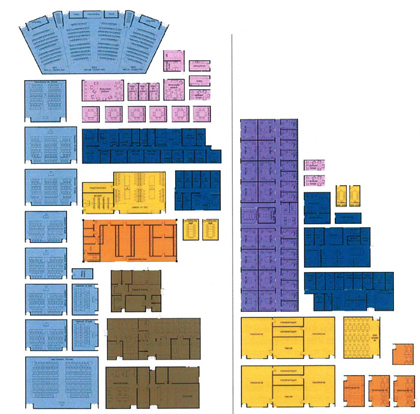 A large auditorium will provide space for department-wide seminars. Posted on April 3, 2009 by tbean@illinois.edu. Department and campus representatives joined architects from SmithGroup recently to consider possible building configurations. 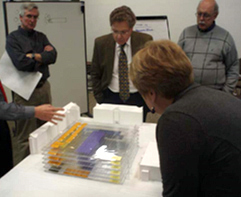 Using plastic models, the group literally mixed and matched various functional areas of the building. The New Building Committee was able to quickly evaluate how various spaces should interact, what configurations seem to enhance collaboration, and what arrangements seem to work best on the site. At least 10 different configurations were evaluated during the session. Sustainable University Compact, which lays out 12 environmental objectives for the 65 colleges that have signed it to date. Governor Quinn, who created the compact while serving as chairman of the Green Governments Coordinating Council, understands the importance of green facilities and is supportive of the planned new building for ECE ILLINOIS. One goal for the building is to attain the highest level of LEED—Leadership in Energy and Environmental Design—certification possible. This would make the ECE building just the second LEED building on campus, after the new Business Instructional Facility. Matching funding for a green ECE building remains in the proposed 2010 State of Illinois capital budget.